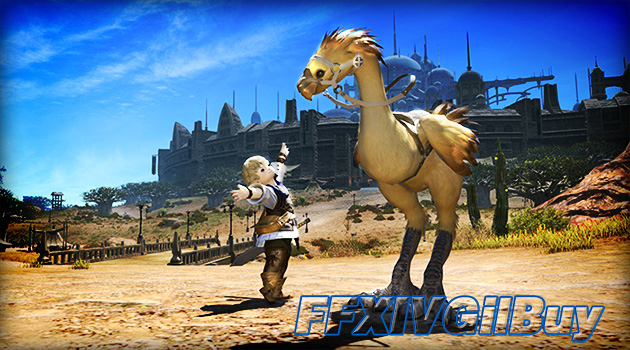 This guide is to introduce how to obtain Chocobo in FFXIV and the way to level Chocobo. Besides, I will introduce the type of Chocobo and the food for it. If you want to buy cheap FFXIV Gil, FFXIVGilBuy provides huge stock of FFXIV Gil with the lowest price! In order to get your Chocobo in FFXIV, you should complete the main story quest - The Company you Keep and do their respective Grand Company story quest to join them. You will need gain 2000 Grand Company Seals and buy the Grand Company name-chocobo Issuance. The pick the Grand Company you choose and click the following. Now you should have your Company Chocobo! It is no matter what is going to take a long time to finish from Rank 1 all the way to 10, not even to mention ranks 10-20. 1.Your chocobo reduces your overall xp gain by 20% so if you would get 100xp solo with a chocobo out you will only get 80xp. 2. Your chocobo timer does not deplete when you mount your chocobo after summoning it. 3. Your chocobo takes 50% of your total xp you gain from monsters. 4. You will need nearly 300 grysahl Greens if you aren't lazy about leveling your chocobo. 5. You need to have a level 50 job and be in a FC with a Chocobo stable with either you or someone keeping it checked on hourly for leveling effectively. 6. You can buy a Reagan Pepper from Grand Company’s billmaster to reset your Chockbo skills for 20 allied seals or 48,000 Grand Company seals from the quartermaster. 7. Your chocobo will max out it's level at Rank 10 however you can use Thavnairian Onions to unlock the next lvl all the way up to Rank 20. The three types of Chocobos are Healers, Defenders and Attackers. Healer Chocobos seak to keep away from the foe and heal the player with magic support trying to help keep him alive in battle. Defender Chocobos seak to take aggro from the player and protect the player with their skills and abilities. Attacker Chocobo's fight the enemy with the player using offensive abilities and skills. There are 5 difeerent foods to feed your chocobo. It is recommended to use curial fruits during leveling. Still you can use below food as long as you like. Basic Krakka roots offer No additional benefit. Using them to feed at a chocobo stable offers 1000x their current level in XP, which means a lvl5 chocobo would get 5 thousand XP. If you are ONLY using the chocobo stable to level your chocobo, please Do NOT use curiel roots. The bonus XP is for enemy kill xp Not feed trained xp. Save yourself the X amount of money.